I love guys. I am not a "man-hater" by any means. Read my last post if you need proof. I just want to highlight some ways that guys often unknowingly mess up with the hope that I can help a few fellas out! If you catch yourself or your boyfriend/partner doing these things, don't worry, just consider watching out for these things in the future. 1. Not picking up the bill on the first few dates. 2. Bringing out your cell phone at dinner on a first date. Sometimes it's best to just leave it in the car. 3.. Over apologizing for every little thing, especially if you did nothing wrong..... uh, not cute. 4. Texting her with "U" instead of "You," "Ur" instead of "You're" and "R" instead of "Are," etc. Text to impress, guys. At least show us you're not lazy. 5. Offering to take us shopping and then complaining after the first store. 6. Telling us multiple times that you're nervous. 7. Flirting with our friends. 8. Critiquing our eating habits. If I want Corn Flakes for dinner, I'll eat Corn Flakes for dinner! No need to make a spectacle of it. 9.. Criticizing someone in our circle of friends/family that you haven't met yet. 10. Doing things for us for the purpose of holding them against us later on. If you want to help us, do it out of kindness, not to get credit for later redemption. 11. Talking about other girls being heavy or fat.... it makes us wonder what you think of us! 12. Rubbing our head like we're a puppy. It ruins our hair! 13. Dunking us under water or splashing us at the pool.... and ruining our hair. 14. Asking for our permission to hold our hand. Just do it. 15. Complaining that we are taking too long to get ready. 17. Making fun of pregnant ladies. I don't care if you think they "wobble" or have puffy faces. Save your "great sense of humor" for yourself. 18. Commenting on our appearance more than you comment on our personality/inner beauty. It tells us your interest is shallow. 19. Speaking poorly about your own mother. To us, it's just a sign of what we're in for. 20. Getting jumpy when she picks up your cell phone. It looks like you're hiding something. 21.. Not taking your shoes off the first time you visit our place. Manners, boys! 22. 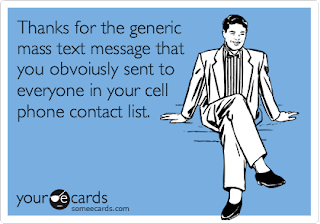 Including us in one of your mass texts. Yes, we can tell. 23. Texting us and Facebook chatting us, but not speaking to us in person. We assume you're either a tease or lacking confidence. 24. Mooching off of your friends/family. Yes, we notice.... HUGE RED FLAG. 25. Not offering us your jacket when we are cold.... it tells us that you are not the provider/protector type. TIP: If you offer us your jacket or shirt, most of us will refuse it and say "No no, it's okay" so INSTEAD you need to take off your jacket/shirt without prompting and put it on our shoulders. It will set you apart in a good way. Ladies, let me know if you agree with these. And guys, if you catch yourself doing any of the above, try to stop the bad habits while you can.